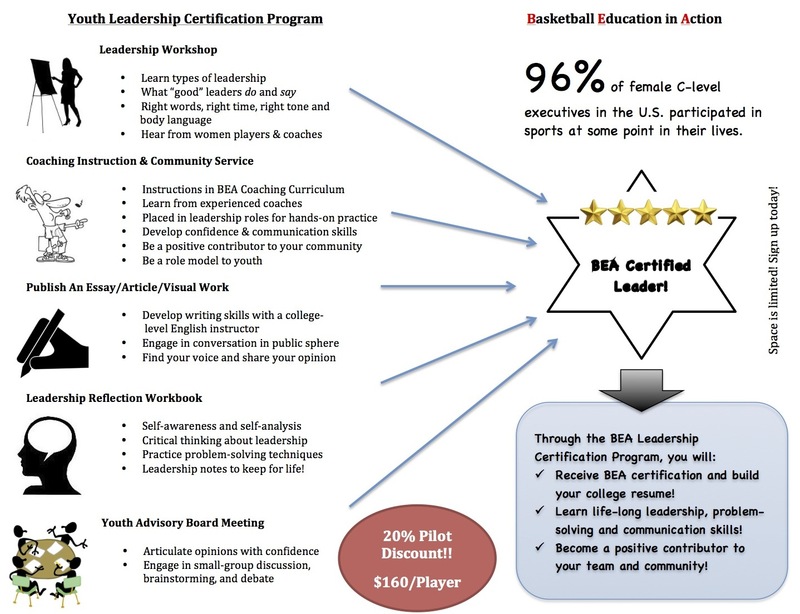 New Program: Youth Leadership Certification! The Youth Leadership Certification Program uses the game we love to mold young girls today into strong leaders of tomorrow. (Open to current high school sophomores, juniors, and seniors). The program is flexible to fit youth leaders’ own schedule, but requirements must be completed between September – December, 2016. The program not only teaches girl athletes how to lead and why it matters, but it offers leadership instruction, hands-on experience, and service-learning in the community. The girls will practice written communication as well as vocal leadership, and they will engage in conversations with the public. The program develops self-awareness, problem-solving and critical skills–boosting their confidence to lead on the court, in their communities, and in their lives! Space is limited to a small group. Contact Bea Chang at changb.10@gmail.com for more information and reserve a spot by September, 2016.